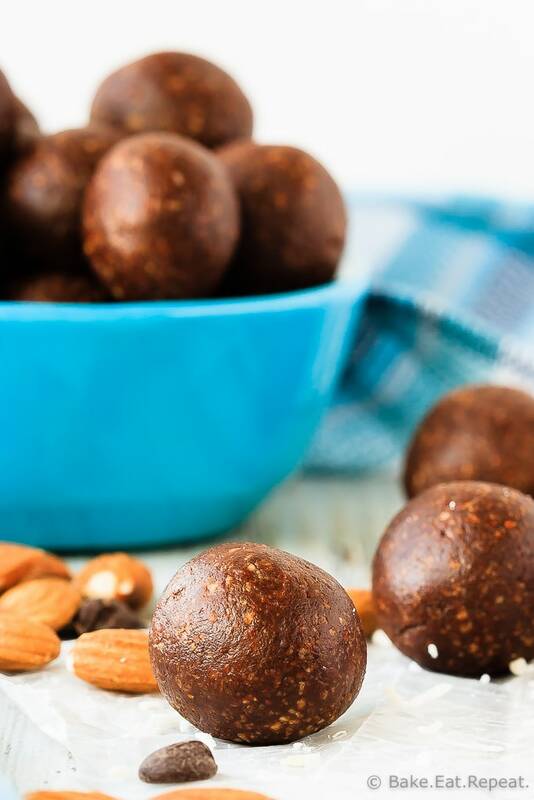 Quick and easy almond joy energy balls that mix up in minutes and are a healthy, tasty snack full of coconut, almonds and chocolate! The perfect lunchbox snack! I’ve never really jumped on board the whole “energy balls are amazing” train. I’ll just throw that out there. I made these apricot energy bites, and they were okay. I mean my kids loved them and begged me to make them over and over again. And I’ve had other people tell me they were fantastic too. So evidently they’re good. But I didn’t like them. 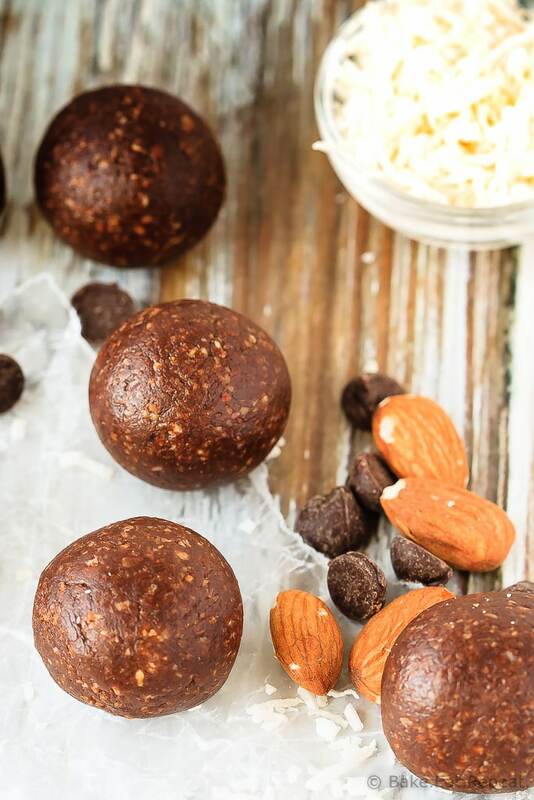 I figured that energy balls just weren’t really my kind of snack – but that’s okay, we can’t all love everything, and I can make them for my kids. Because they DO love them and it’s a healthy, easy snack to whip up for them. But I’ve now decided that I just need chocolate to make them fantastic. We all know that chocolate makes everything better and these almond joy energy balls just prove that fact once again. Because they’re fantastic. Even my husband liked them, and he generally steers clear of any of my healthy snack concoctions. Figures they’re just not worth his time. If it looks healthy he just keeps on looking for snack food elsewhere! But these he ate. And enjoyed. I was a little shocked, I will admit. I mean, I liked them. And the kids loved them. But I didn’t think my husband would even try them, let alone like them, to be honest. Of course, I may have neglected to tell him that dates were involved when he asked what they were. That’s okay, the chocolate, almonds and coconut are the important parts as far as the taste goes anyways. Right? These almond joy energy balls take about five minutes to whip up and keep for quite a while in the fridge. They’re the perfect little bite-sized snack when you need something quick, plus they’re filling and healthy – and taste quite like an almond joy bar. I might like energy balls after all….as long as there’s some chocolate involved. I’ve also shared the Almond Joy Energy Balls recipe over on Food Fanatic. 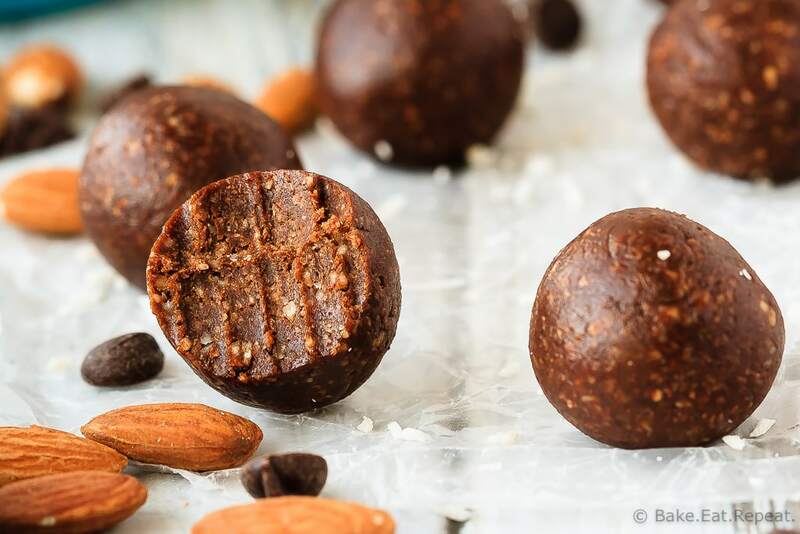 I've had one major energy bites recipe fail and haven't made them since, but now I want to give them another try! These look amazing! It took me a while to try energy bites too, but once I did, I was hooked! This sounds like such a delicious flavor, Stacey! I'm sure your kids devoured these in no time. Such a great breakfast or snack! Almond Joys and Almond Joy flavors are just the best. I love these little bites of energy!